How do you exude authenticity, while at the same time selling $2.5 billion worth of product a year? This is the question Anheuser-Busch InBev is hoping to answer this spring with the rebrand of Budweiser and Bud Light. Let’s take an in depth look into the rebranding of an American icon. To begin, why would a beer brand with these kind of sales figures even consider changing its packaging? For one major reason, the beer market is changing, fast. With millennials now making up 25% of legal beer consumers in America, the landscape in the industry has changed drastically in a very short period of time. It’s this seismic shift in the marketplace that has been partially responsible for the meteoric rise of craft beer, the newest competitor that is taking a chunk out of Budweiser and Bud Light’s sales. Craft beer sales are rising quickly, with the most recent industry survey posting an increase of 22% in retail dollars earned in 2014 alone. The category overall earned a grand total of $19.6 billion in total sales in 2014. What’s driving this surge in craft beer popularity? One key factor is the desire for authenticity. Millennials are the most skeptical generation in history when it comes to advertising, with at least one reputable survey in 2015 reporting that only 1% admit to placing their trust in messages from an advertisement. This distrust in an increasingly advertising saturated world leads to authenticity being a driving factor for millennials. The same report found that 33% of the demographic gets a majority of their information from trusted social sources, and a further 43%  directly identify authenticity as key to trust. Craft beers embody this authenticity, unfortunately Budweiser and Bud Light are on the wrong side of this consumer need. “There is a growing demand for authenticity … and today’s mass brands [look] very ‘overproduced.’ .”— says Geoff Cook, a partner at Base Design, the firm responsible for the 2014 Miller Lite throwback branding which resulted in an 18% sales bump for the brewer. Budweiser and Bud Light would have a very hard time billing themselves as small, batch crafted brew, so they’re taking a different route to authenticity, they’re focusing on tradition. While they may not be able say that they are micro brews , it’s much harder to deny that Budweiser, and by extension Bud Light certainly have a long, storied history of beer making. For 2016, they are choosing to leverage this history with their new branding strategy to push themselves as an authentic beer choice. What does Authentic look like for Bud Light? To start, the throwback inspired branding re-introduces the long absent Anheuser-Busch crest and does away with the ‘swoosh’ device that has dominated the can’s design since 2002. The typeface that the brand has been cultivating ownership of for the past 15 years has changed as well. The newly designed font dubbed ‘Bud Bold’ was inspired by the industrial lettering of the original Budweiser brewery in 1860 is meant to convey “confidence and quality”. The previous can design was a simple text driven affair, which has been replaced now with the bolder font and a larger emphasis on imagery. It will be interesting to see how consumers react to this and what emotions this evolved brand element will evoke. Hotspex recently conducted our own internal study to understand the influence brand assets in the beer category have on consumers. We found that only an average 38% of respondents could correctly identify a leading beer brand’s typeface when prompted, with the most recognizable typefaces only registering in the low 50% range. As a counterpoint, we also garnered insight into the crest as a design element. We asked consumers to identify a selection of brand logos, and found that the correct brand was identified 65% of the time on average, with the most recognizable brands being correctly identified more than of 90% of the time! Re-introducing the crest is a powerful signifier of Bud Light’s intent to project a stronger, more classic look and feel. To make the most of this rebranding Anheuser-Busch will need to invest significant effort in building and reinforcing memory structures among younger consumers who are not yet familiar with the crest. What does Authentic look like for Budweiser? 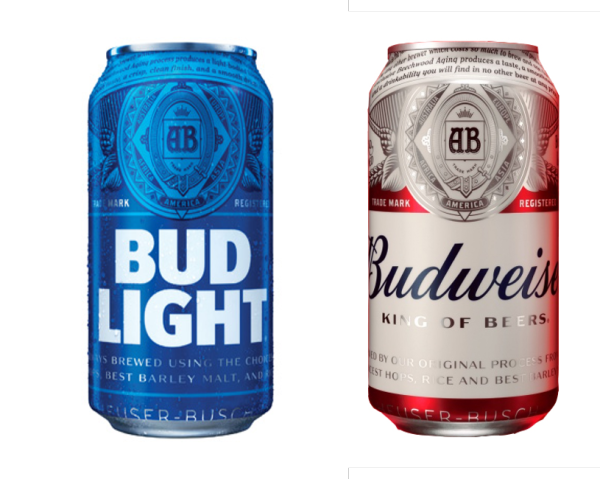 In addition to rebranding Bud Light and all of its related assets, Anheuser-Busch InBev is also in the midst of a revamp of ‘The King of Beers’. The AB crest is in the forefront here as well, further highlighting the parent brand’s heritage credentials. The craft style revamp will be carried out across all of Budweiser’s assets. The new branding sees Bud Light dropping the red accent in its swoosh device, this allows Budweiser to fully own the colour red on its packaging. 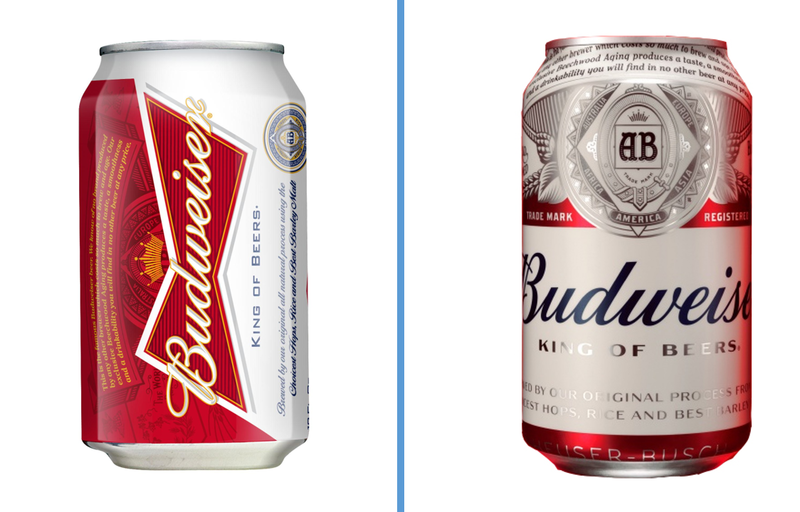 With the return to dark blue hand written font, which the creative agency responsible for the rebrand JKR has named ‘Bud Crafted,’ Budweiser has harkened back to its old brand colours but retained the handwritten logotype from its most recent packaging iterations. The most striking change is the removal of the iconic ‘bowtie’ graphic asset, which lives on in advertising and off package graphics. Could the added focus on millennials, alienate heavy users and brand loyalists? Anheuser Busch built their brewing legacy long before millennials impacted shifting demographics of beer. The company has been around long enough to know that you can’t sacrifice your company’s present at the alter of the future. This redesign also has to take into consideration the brand’s existing customers and respects their loyalty. This focus on tradition has two key benefits. As we mentioned a rebrand focused on the traditional intrinsically links the product with a feeling of authenticity. While both beers are shifting focusing to future generations of beer drinkers they can’t ignore the factors that have made them some of America’s best selling beers. It is those same factors however, that have led to a purchasing demographic that skews above 40. This balancing act between traditional consumer base and new customer acquisition could have been a disaster, but the new assets do a good job of taking both demographics into consideration. On the bottom half of the can, the bold lettering, and more modern text, replaces the italicized script from the previous designs which didn’t resonate with millennials. At the same time, the restoration of the Anheuser-Busch crest and the return of the classic Budweiser text around the top of the can assures the current audience that the company respects them. Anheuser-Busch is walking a fine line with this branding update. 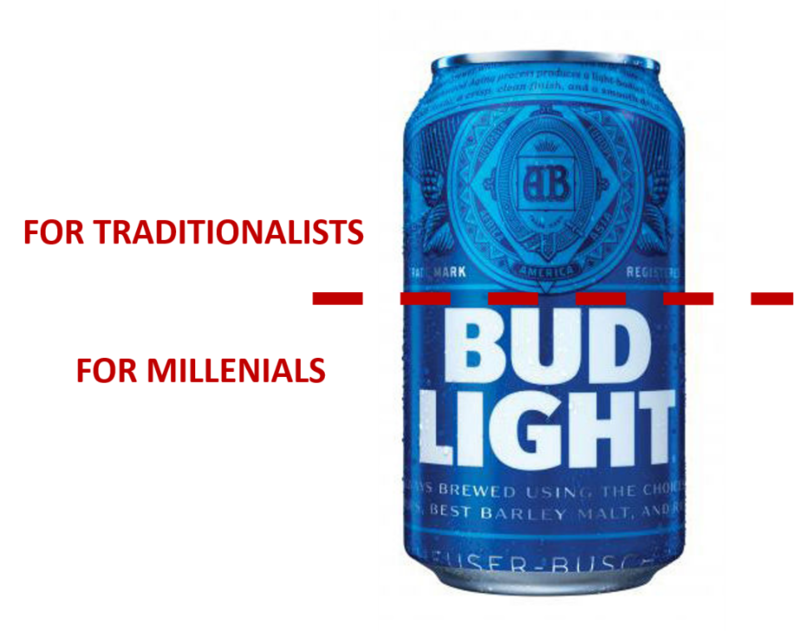 Attempting to speak to two very different demographics is no easy task, even for a brand with the history and marketing savvy of Anheuser Busch. Consider the alternative though, for the brands to remain static and ignore a changing market would almost certainly imperil their brand’s longevity. Knowing which of your brand’s assets are critical and which assets can be evolved to capitalize on shifting market trends is one of the keys to a successful global brand. The rebrands identify trends and balances consumer needs with brand identity to create a cohesive, and effective new branded design that looks great and keeps a traditional player in the ever changing beer game. Sadly, it is easy to underestimate the risks associated with changing your packaging. Over the years, your brand has built memory structures related to its branded assets in the minds of consumers. In the shopping environment, these cues on pack act as mental shortcuts that allow consumers to notice your brand, recognize it, and quickly recall its promise. Messing around with your brand identity can lead to consumer confusion and really hurt your brand. It is key to understand your brand identity and which of your brand assets are most distinctive and relevant to consumers. In this way you can know which assets are sacred and must be left as is, while identifying brand elements that are not adding value or worse, holding back your brand. Once you have identified which assets are troublesome you can evolve or remove them to free up real estate for the assets that are working hard for your brand. Click here to learn more about brand assets.